You are probably right Dugald. I just remembered hearing that he was a plasterer somewher & had a very thick accent so I just checked Via google. Across the road from this, but you get the idea. pee ess, gents, is this no the 'Bombs Over Glasgow' thread? Hi there I have come into this thread very late just wondering if anyone has mentioned the arial mine that exploded very near the railway bridge at Anniesland Cross in fact right where the Esquire House was later built. I remember playing the hole in the mid 50s with my pals. A lot of the devices dropped on Glassgow and surrounding areas wern't actually bombs but arial mines when dropped they deployed a parachute to get them onto the ground where they went off. They were designed to cause maximum surface damage to the area rather than penetrate the ground before exploding. Yes, Igor, the "arial" mines have been mentioned a few times. They were simply called "land mines" during the war. That in fact was what they were, although they were I think (not sure), actually "sea mines" built for use in mining the sea, but used for land 'bombing'. They were as you mention, intended to create more surface damage by virtue of there being no deep penetration. Quite a lot fell on Clydeside. Offhand, I can tell you one fell on Plantation St in Govan in the Blitz. One also fell near the bus garage at the hill on the Inchinnan Rd. (I know about this one for a fact, since i got a piece of the parachute.). THe Inchinnan Rd. one was not during the Blitz, it was later. Britain used big "cannisters " filled with explosives to create the same blast effect as the German 'land mines' . The 'cookie' for example: "a 4000 H.C. bomb consisting of two light cased cylinders welded together and filled with amitol - aerodynamic shape of brick - used to demolish structures - also called a blockbuster".
" My Granny said that in Clydebank, the pink bombs were the worst." would someone please tell him what the heck is meant by "the pink bombs were the worst? He has no idea what these guys are talking about. Yes Dugald as far as I know the aerial mines were and adaptation of the parachute assisted magnetic sea mines without the magnetic bits and just went off on contact with the ground. One of my uncles drove an auxilary ambulance durring the war, early on the morning after the Cyldebank blitz was ordered to Clydebank all the way from Baillieston. I remember him saying "Going along Dumbarton Road right up to the border between Glasgow and Clydebank there was no sign of bomb damage, I was thinking that it "couldn't have been much of a raid but exactly on the boundary a bomb had hit the tram lines and the rails were blown up twisted in to giant knot, from that point on we knew it was bad"..
Twenty five years back I remember vividly reading the book "The Secret War" by Prof R V Jones and his description of "the Battle of the Beams", Jerries use of the Knickbien navigational aid was of course the explanation for this amazing accuracy. It must have been quite chilling at the start of the war when the RAF could trace the Radio Beams when they came on in the afternoon to where they crossed and knew exactly where the Air Raid would be taking place that night. Yet in the early years of the War they did not have the technology to deflect or interrupt these beams. I understand that no specific warning was given to the population of the target area until the Luftwaffe was sighted about 20 - 30 minutes away. Apparently the authorities had considered early in the War evacuating areas when they picked up the Radio Beams, but there were occasions when the Radio Beams changed a couple of hours before a raid or in some instances they were turned off altogether. I've been interested to see that there is little mention of the effect of the Anti-Aircraft fire with regard to the Clydebank Blitz. Local sites say nothing, or that the ground based defence ran out of supplies fairly early on, and also criticise the local authorities for not considering their town to be a high priority target. 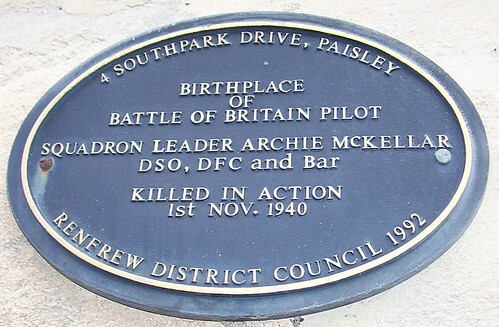 Surely a surprising response into the town's far from insignificant contribution to the war effort of the time, and the fact that the area had a massive oil storage facility nearby in Old Kilpatrick. From the info I've read so far, only two bombers were shot down, and those were attributed to the RAF, with no hits for the AA fire. ORP Piorun was an N-class destroyer used by the Polish Navy during the Second World War. The name means "Thunderbolt". Piorun was built by John Brown & Company of Clydebank, Glasgow: she had been laid down in July 1939, launched on 7 May 1940 and completed on 4 November 1940. Originally commissioned into the Royal Navy as HMS Nerissa, she was transferred to the Polish Navy as a replacement for the destroyer ORP Grom which had been lost off the Norwegian coast on 5 May 1940.
junkcatcher wrote: Twenty five years back I remember vividly reading the book "The Secret War" by Prof R V Jones and his description of "the Battle of the Beams", Jerries use of the Knickbien navigational aid was of course the explanation for this amazing accuracy. Interesting stuff Junkcatcher. I recall the rumours about these Knickbien navigational aids the Germans used. It was said, I think after the war, that the reason Dublin got bombed was because the British were able to "bend" the German beam. I don't know how true this was for, as Socceroo points out: "... in the early years of the War they [British] did not have the technology to deflect or interrupt these beams.". For the most part, the Germans used two blind bombing aids in the Battle of Britain: X-Gerät and Knickbein. Of the two Knickbein was the less accurate. Both employed very similar methods based on pre-war Lorentz navigation / landing radio beam systems. In both there was a dual main beam transmitted from a ground station that was inline with the target. This dual beam broadcast dots on one lobe and dashes on the other. When a pilot was exactly between the two lobes he could hear a steady tone on the receiver for the system. This was how the Lorentz system worked. Knickbein and X-Gerät added additional cross beams that indicated to the pilot when the target was approached and when to drop his bombs. In the case of Knickbein, there was a single crossing beam that gave a signal on the equipment in the aircraft to drop its load at that point. X-Gerät was more complex. It employed automatic features and three crossing beams. The first beam signaled the aircraft that it was approaching target. On the second signal the crew started a clock mechanism that counted down towards the drop point. The third beam started a second clock hand that moved towards the first. When the two hands met the bomb load was automatically released over the target. Because of this complexity and only a few units in service only KG 100 had been equipped with this device. They were to act as pathfinders for the rest of the bombing force. The British were made aware of these devices both through espionage and electronic reconnissance. They devised a jammer based on pre-war Lorentz equipment they already had. What their jammers (variously Meacon and Bromide) did was inject a false signal into the main beam making the homing signal appear at the edge of the dotted beam instead of in the middle of the two beams. Thus, a pilot would be drawn off to one side of the target rather than fly the true path marked by the equipment. What happened at Coventry was that this was the first time X-Gerät was used by the Germans and the British had only four stations available for jamming. Additionally, the British had slightly misjudged the frequency on which the Germans were operating allowing pilots to hear through the jamming the correct signal and thereby making accurate bomb runs. Once the Germans realized that their blind bombing aids were being jammed they attempted a third system called Y-Gerät. It was a variant of previous systems and quickly jammed too. At this point, the bombing campaign was becoming clearly a failure and Russia loomed into the picture causing the Germans to pretty much drop the whole field of blind bombing aid development. X-Gerät and Knickbein soldiered on in the East, where the Soviets never jammed them, until the end of the war. It was Knickbein that was used for guiding the Poltava raid in 1944 for example. There it worked quite well unjammed. I've read some forums that discuss the Dublin bombing, and British beam bending, but the true details aren't known (and probably never will be, if there are any) and the discussion tend to degrade into the British/Irish fight/argument/discussion, so end up going nowhere. Now that's real technical stuff Apollo... but no less interesting. I think the Germans were into their guided bombing missions a bit before the British. If, as your text indicates, Coventry was bombed using the X-Gerät beam then they were at least a year ahead. I think at the time the Luftwaffe was bombing Coventry (1940?) the RAF were still droppping their bombs by the "hit and miss" method. Anyway, the RAf eventually got into the guided-beam business itself and it helped a great deal, although it was by no means perfect. I think the main point of Junkcatcher's note was the use of the beam-accuracy at Clydebank. This is actually the first time I have come across this claim. I don't know if it is true. Certainly the bombers were close on target... while Browns' yard wasn't hit all that that much, the residential area was devastated. The bombers came from Norway, quite a long trip to Clydebank, and one wonders at the Germans having already installed their beam-generating equipment there. In an earlier post (by either you or Doonunda) there were two Luftwaffe aerial pictures of Clydebank taken in 1939 (or was it 1940?). This was a while before the actual blitz and, despite the apparent great accuracy of the pictures, I doubt the Germans would have used either the Knickbein or X-Gerät in obtaining them. My point? Clydebank attests to the Luftwaffe having been pretty good "bombers" even without the beams. Yes, I too doubt we'll ever learn the whole truth about the Dublin raid. The "beam-bending" theory makes good reading, and on this count alone, the rumour will no doubt endure. Dont know if this pic has been posted in the thread before. its from the glasgow story. An aerial view of Clyde shipyards and docks taken by a Luftwaffe reconnaissance aircraft in October 1939, shortly after Britain went to war with Germany. Alexander Stephen & Sons's shipyard is marked for special attention, as are the shipyard of Barclay, Curle & Co, King George V Dock, and, at the bottom left hand corner, the Rolls-Royce aircraft engine works on the Hillington Industrial Estate. Glasgow did not suffer such intense air raids during 1940 as did many large English cities. 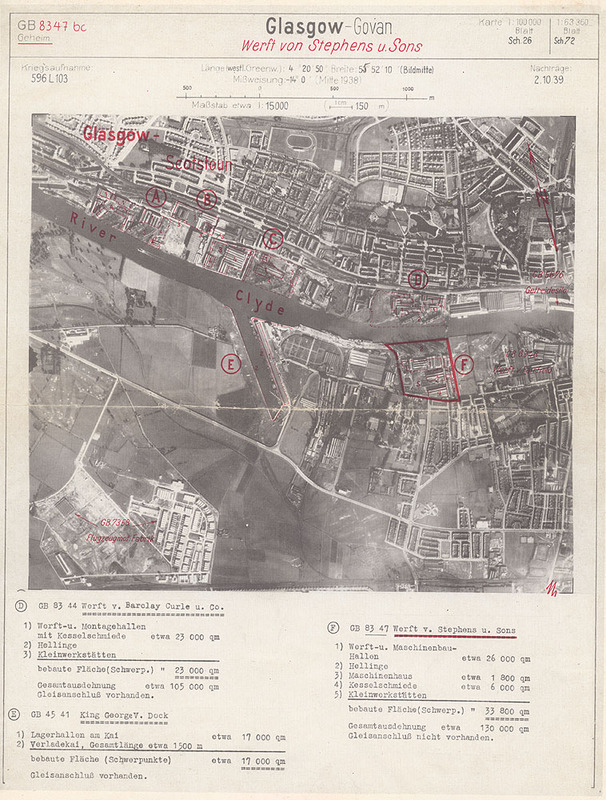 Any complacency was dispelled by intense bombing raids on the nights of 13-14 and 14-15 March 1941, when an estimated 250 German bombers attacked Clydeside targets and caused extensive damage and heavy casualties. The raids became popularly known as the "Clydebank Blitz" because of the scale of devastation in the town. However, more people were killed in Glasgow where the damage was spread over a wider area. In the worst single incident, 110 people died when a landmine exploded between a tram and a tenement in Nelson Street. 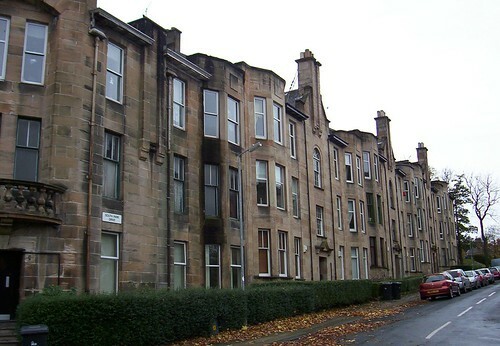 Tenements were destroyed in Kilmun Street, with eighty-three deaths. Eighty workers were killed in a direct hit on their shelter at Yarrow's Shipyard. In Peel Street, Partick, fifty people died when their tenements were bombed. Mori, I'm not sure if the exact same aerial photo was shown, but certainly some others from the same series are available earlier on the thread. It's noteworthy that Fairfield's yard is also shown quite clearly on the photo. The Germans refer to the photo as being that of Stephen's yard, yet you fail to mention they planted a bomb (could have been a mine) just across the road from the engine shop shown on their photo as Item "4", and demolished a tenement with a heavy loss of life. Seems their aerial photo was put to good use. It's still an interesting picture Mori. Cheers, Dugald.